My family has this strange obsession with my green jello salad. They have been known to go gaga for it. It’s a yummy concoction of jello, cream cheese and pears. The flavor melding is to die for!! This started out as Christmas Dinner jello. Then it progressed to making it for people’s birthdays. I have been know to make this in a 13×9″ pan, stick in some candles, and sing a rousing Happy Birthday to the guest of honor. It’s been around for a long time, and is one of those family favorites that will go down in the history books. Drain the pears, reserving the juice. Pour the juice into a measuring cup and add enough water to make 2 cups of liquid. Pour this into a small saucepan and bring to a boil. Add the lime jello and stir to dissolve. Chill the mixture in the pan until slightly thickened, but not set. 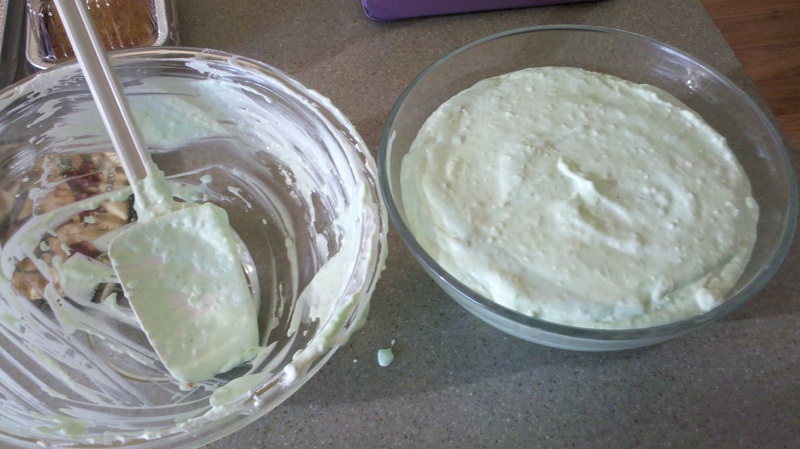 While waiting for the jello to set- whip the whipping cream and keep it chilled in the fridge. Chop the maraschino cherries and drain. Once the jello mixture is set, pour it into your favorite mixing bowl, and it should be quite a deep bowl. Now beat this mixture until frothy. Add the softened cream cheese and pear slices, and beat until smooth. Fold in the whip cream, cherries and nuts. If you have any extra cherries you can garnish with these once the salad is slightly set. Pour the entire contents of the bowl into an oiled 12 cup mold or a 13 x 9″ pan. Chill until firm, about 2 hours, or overnight. To serve, unmold the salad or cut it into squares and enjoy. This recipe is great for your potluck parties, family gatherings, any occasion where you will be feeding a crowd. It’s been a very popular recipe here at the Party House, and I look forward to passing the recipe along to the generations to come. Also, I just realized this is a great summer jello salad, because all of the flavors together are just so yummy. Hard to describe in words alone, you really must try it. What’s your favorite jello salad? I have to admit I’m not a mayo person, so I probably wouldn’t try your recipe. But, thanks so much for stopping by and sharing. Hope you get to try this recipe soon. I have to warn you though it’s a little addictive, so be careful.